A comprehensive review of the performance of Britain’s manufacturing sector in 2016 was launched at the Department for Business, Energy and Industrial Strategy on Thursday 15 December. The 260-page book charts the key news, announcements and investments in different manufacturing sectors and technologies across the year. It also reports on the main themes affecting the sector – such as Brexit, 4IR or ‘4th Industrial Revolution’ technologies, commentary on the industrial strategy, and education & skills provision – in 2016, and the progress of industry in China, Germany and the US, with forecasts for 2017. The car industry, aerospace, defence, motorsport, the pharmaceutical sector and food & beverage are covered along with plastics, electronics, sensors, textiles, space and more. Among technologies, automation and robotic systems, additive manufacturing, metrology and photonics are covered, plus a +30-page section on digital manufacturing technology. 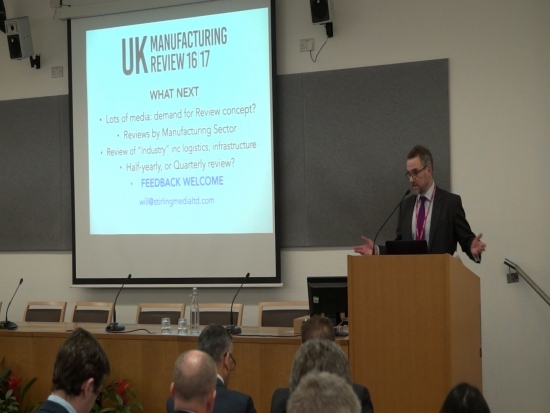 The Review is distributed to 5,500 directors, managers, engineers and academics working in manufacturing and engineering via the 12 sponsors and partner organisations, and with the help of manufacturers’ organisation EEF and Policy Connect. 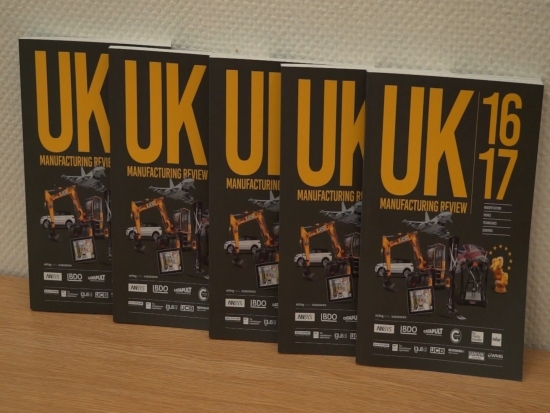 Copies are also available on the review website http://www.ukmanufacturingreview.com/2016. The launch, to an audience of 90 people, was co-hosted by MADE HERE NOW, a multimedia project originated by Peter Marsh ex- manufacturing editor of the Financial Times and operated by marketing company Pepperneck. A sneak preview of phase 2 of the Made Here Now website was revealed along with plans to cover more stories about Britain’s manufacturing companies in video and photo media. Alan Mak MP spoke about government’s engagement with manufacturing, as chair of the All-Party Parliamentary Group’s new 4th Industrial Revolution group. Director of Strategic Technology at BAE Systems Andy Wright explained how the company is working with more universities and small companies on technology transfer and said that this sector-wide collaboration was vital to BAE’s success. Both the UK Manufacturing Review and MADE HERE NOW plan to develop further in 2017 as interest in the manufacturing sector grows and efforts to promote it continue, including investment from organisations such as Innovate UK, the High Value Manufacturing Catapult and the Engineering and Physical Sciences Research Council which announced the funding of six +£10m Future of Manufacturing Hubs on 13 December. For more information visit: http://www.ukmanufacturingreview.com/2016.